Marshmallow is a sweet snack that is a children's favorite. The taste is sweet with a soft texture, making this one snack familiar on the little one's tongue. Usually children eat marshmallow directly, and in adults, this food becomes a companion when drinking coffee or afternoon tea. However, is marshmallow consumption good for children's health? Especially if they make it a snack almost every day. Basically, marshmallows are sweets with sugar as the main ingredient. 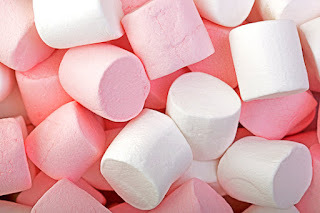 Although the shape is different from most sweets, the content of marshmallows is the same as candy in general. Actually it's okay to enjoy marshmallows, but for health and weight control, intake of sweet foods must be limited. In general, one marshmallow contains 4 grams of sugar. That is, one serving or 4 marshmallows contains 16 grams of sugar. So, don't underestimate the sugar content in this light snack. Why can over-eating marshmallows have a bad impact? The sugar content in sweet foods has the potential to cause various health problems. Unfortunately, knowledge related to the sugar content of each food is still low. What are the dangers of consuming sweet foods excessively? Excessive sugar intake has the potential to cause cholesterol disorders. Based on one study, adolescents who often consume sugar have higher LDL cholesterol ("bad" cholesterol) than those who consume only a little sugar. High LDL levels can increase the risk of heart and blood vessel disease. You might not believe your mother's advice when you were little, namely to brush your teeth after eating sweet. Your mother is right, because sweet foods can damage teeth. The bacteria that cause cavities will use the sugar that sticks to your mouth after eating something sweet. In the long term, this can end in cavities and dental infections. The amount of added sugar can cause your heart to become resistant to insulin, an important hormone that helps enter sugar in the bloodstream into your cells to be processed into energy. In the long term, insulin resistance can cause fatty liver (fatty liver). Fatty liver is a buildup of excessive fat in the liver cells, and can cause impaired liver function. The relationship between sugar and heart disease is not as sweet as sugar. Excessive sugar consumption causes an increased risk of heart and blood vessel disease. In addition, consumption of sugar can cause weight gain and obesity, both of which are risk factors for high blood pressure and metabolic syndrome. High blood pressure and the metabolic syndrome are the causes of cardiovascular disease. In addition, excess sugar can be converted into fat and increase cholesterol levels which can clog arteries, a major cause of heart attacks and strokes. So, it doesn't matter if you and your child want to enjoy the sweetness of the marshmallow occasionally. However, don't overdo it, because excessive sugar consumption is not good for health. 2 Responses to "Marshmallow is Not Good For Children Health!" While wellbeing includes master dynamic venture to have a person sound in life elements as a coordinated exertion towards opportunity from disorders and illnesses. Recuperating is a recouping and a help from agonies however wellbeing is a condition of being.